PALU, Indonesia (AP) — Search teams pulled bodies from obliterated neighborhoods in the disaster-stricken Indonesian city of Palu on Saturday as more aid rolled in and the government said it was considering making devastated areas into mass graves. Indonesia’s disaster agency said the death toll from the powerful earthquake and tsunami climbed to 1,649, with at least 265 people still missing, though it said that number could be higher. More nations sent aid and humanitarian workers fanned out in the countryside. Balaroa was one of the areas hardest hit by the Sept. 28 magnitude 7.5 quake, which threw homes in the neighborhood tens of meters and left cars upright or perched on eruptions of concrete and asphalt. Many children were in the area’s mosque at the time of the quake for Quran recitation. An assistant to the Imam had said none survived. Indonesia’s top security minister, Wiranto, who uses a single name, said the government is mulling the possibility of turning Balaroa and Petobo, another neighborhood in Palu, into mass graves. Petobo disappeared into the earth as the force of the quake liquified its soft soil. Liquefaction also struck a large section of Balaroa. He said it’s not safe for heavy equipment to operate there. Wiranto also said on local television that the government is discussing with local and religious authorities and victims’ families the possibility of halting the search and turning the areas into mass graves. The victims can be considered “martyrs,” he said. A Japanese Self Defense Force plane landed at Palu’s airport Saturday morning. Soldiers unloaded tons of supplies, including medicine and small portable generators, in boxes emblazoned with the Japanese flag and the words “From the People of Japan.” Several other nations have also sent planeloads of aid. Video showed the military dropping supplies from helicopters in places and a large Red Cross ship docked at a port in the region. In the dusty one-road village of Pewunu, excited children shouted “Red Cross! Red Cross!” as one of the aid group’s medical teams arrived and set up a makeshift clinic in a field where evacuees were sleeping under tarps. One villager said they survived by ransacking shops. Doctors performed medical checks on elderly residents who emerged from tents and climbed the stage’s stairs with canes or others supporting them. “There were supplies, but these were looted. All along the roads toward here, they were looted by outsiders,” said Bahamid Fawzi. The earthquake and tsunami swept away buildings along miles (kilometers) of coastline and knocked out power and communications for several days. 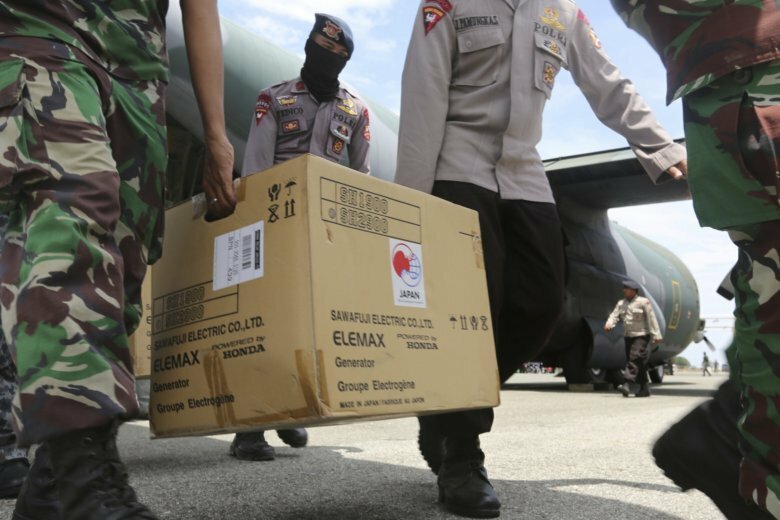 In a rare move, Indonesia’s government has appealed for international help to cope with the tragedy unfolding on Sulawesi island. The United Nations Office for the Coordination of Humanitarian Affairs says $50.5 million is required to deliver “immediate, life-saving” aid.